How do I know about the details of the post for which Recruitment is notified? How to get application form? Is there any laid down format which is to be adhered to? What care I should take while filling up the application form? What is the amount and mode of payment of application fee? How should I send my money to Railway Recruitment Cell? How do I know the schedule of the examination and the center allotted? 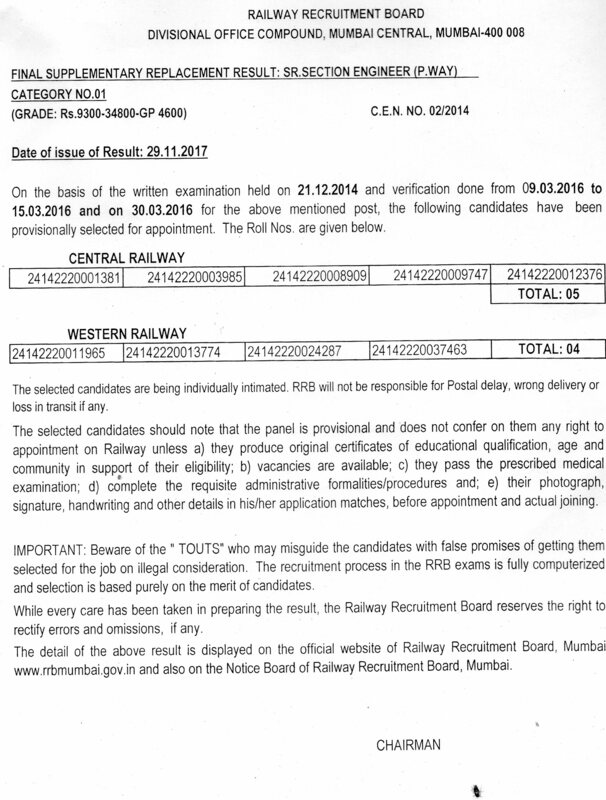 What If I do not receive any communication from Railway Recruitment Cell for the examination? 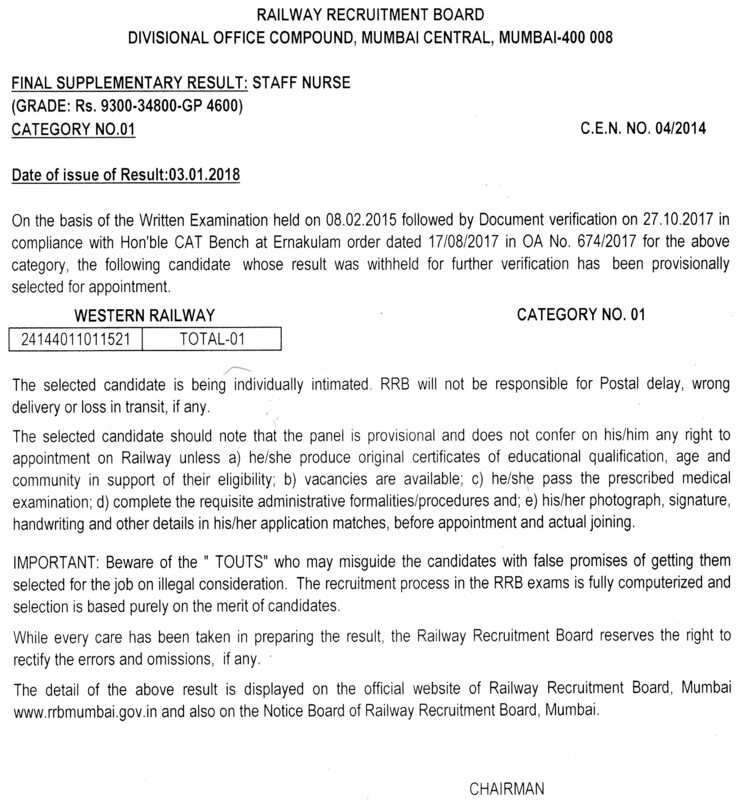 The detailed notification showing the name of the post, qualification, vacancy details etc. Is published in Employment news / Rojgar Samachar and an Indicative Advertisement is also published in local news papers. The application form and format for different certificates required such as for SC, ST, OBC etc. are published in the Employment notification and can also be downloaded from this web site (click forms link on the home page). Detailed Employment notification must be read carefully before filling up the form. Ensure that proper fee is submitted through IPO or Demand Draft from a Scheduled Bank. In case of reserved community, the application should be submitted along with the caste certificate in proper format as shown in annexture duly signed by competant authority. Make sure that you have filled in all the required details in the application form in the format prescribed in your own hand writing. For SC, ST, Ex-Servicemen and Physically Handicapped candidates there is no application fee. For all others it is Rs.40/- (Rs. Forty) for the post having payscale upto 3050 - 4590 and Rs 60/- (Rs. Sixty) for all the post having pay scale higher than 3050 - 4590. The application fee can be submitted in the form of IPO or Demand Draft. IPO/DD should not be of a date prior to the date of notification. The Demand Draft should be from a Scheduled Bank with a validity of not less than 6 months. Cash/ Money Order or any other form of fee is not acceptable. 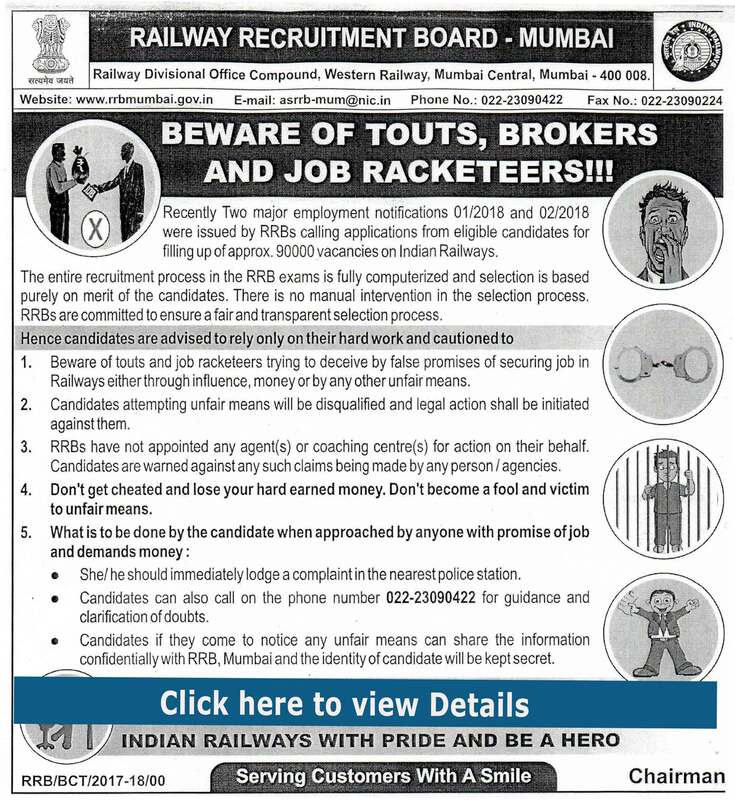 IPO / DD should be Drawn in favore of ASSISTANT SECRETARY, RAILWAY RECRUITMENT BOARD PAYABLE AT MUMBAI. How should I send my money to Railway Recruitment Board? The duly filled-in application form alongwith copies of relevant certificates and photograph, complying with the requirements as laid down in the Employment Notification should be sent either through ordinary post or dropped in the specific box provided at Railway Recruitment Board's office. The schedule of examination is published in the Local News papers of Zonal jurisdiction, Employment notice / Rojgar Samachar and on this Website. 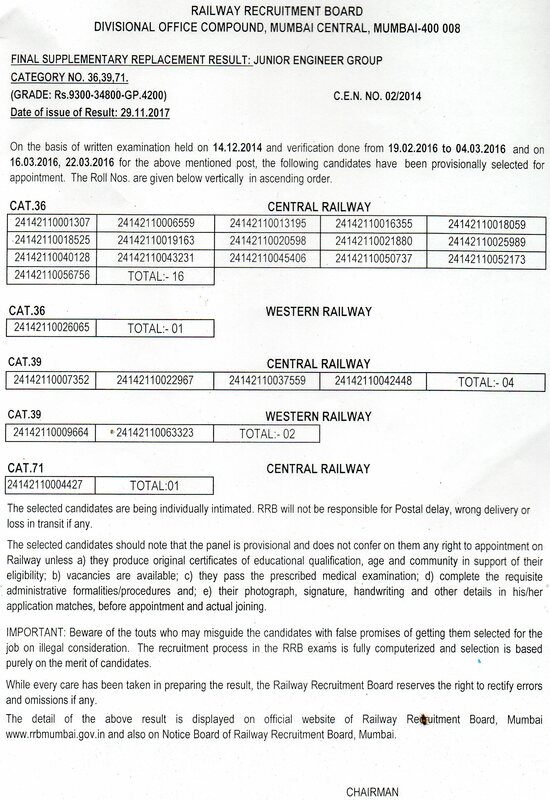 Railway Recruitment Board also sends call letters to the eligible candidates under UPC for the examination. The Call letters are sent to the candidates before 1 month of the scheduled date. However, RRB Mumbai is not responsible for any postal delay, wrong delivery or less in transit. 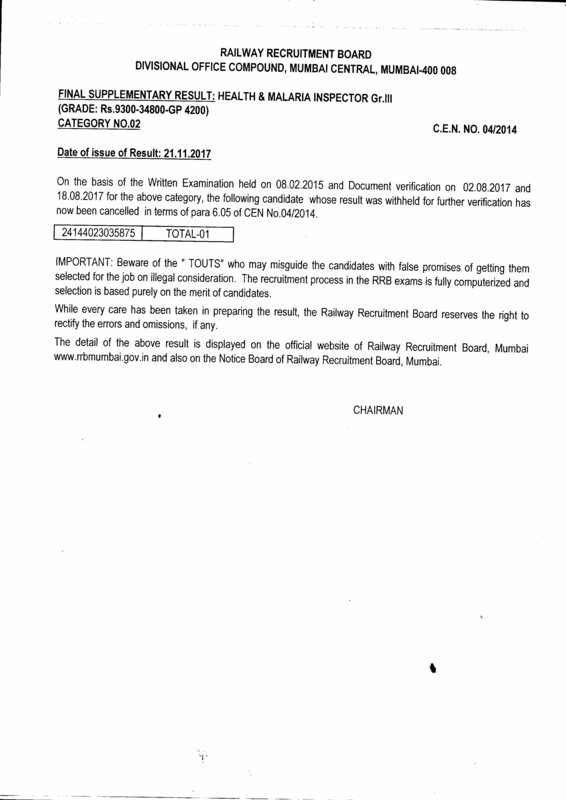 What If I do not receive any communication from Railway Recruitment Board for the examination? 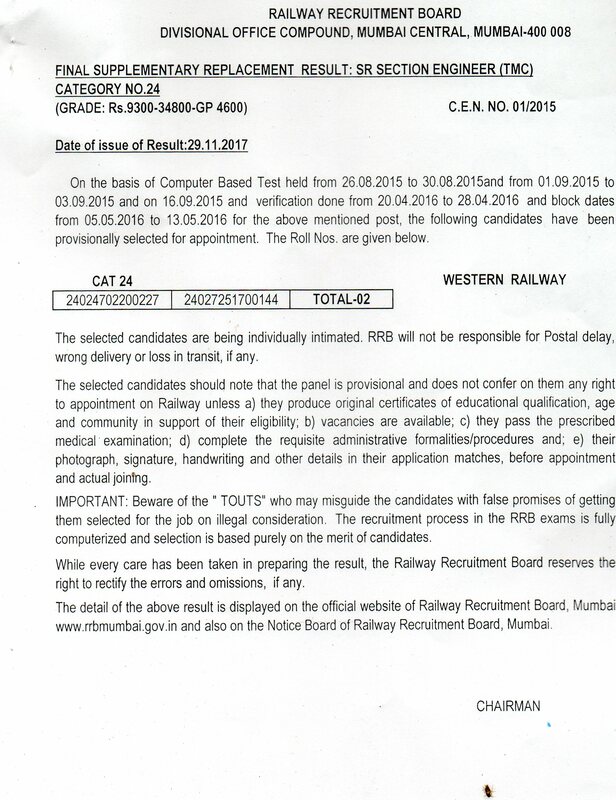 You can know the status of your application on this website or contact Railway Recruitment Board, Mumbai. On Telephone no. 022 - 23090422 during office hours. An Enquiry counter is operational on all working days during office hours.